Johnson's Pennsylvania Virginia Delaware and Maryland. 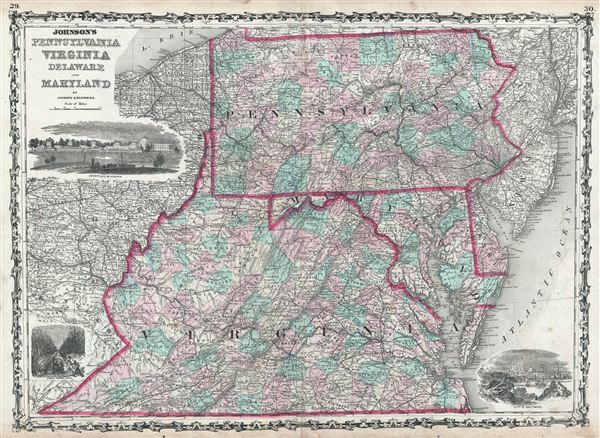 A beautiful example of A. J. Johnson's 1861 map of Virginia, Maryland, Delaware and Pennsylvania. Offers a fascinating snapshot of these north-south borderlands shortly following the outbreak of the American Civil War. Map shows all four states in full with color coding according to county, with Virginia as yet undivided. engraved decorative views depicting the 'University of Virginia,' 'Dismal Swamp Canal,' and the 'City of Baltimore' decorate the upper left, lower left and lower right hand quadrants, respectively. This map appeared only in the 1861 and 1862 editions of Johnson's atlas. The 1862 issue, the last of this series, replaces the lower two insets with Richmond and Fort Monroe – clearly a response to general interest in the region resulting from the activities of the Civil War. Features the strapwork style border common to Johnson's atlas work from 1860 to 1863. Published by A. J. Johnson and Browning as plate numbers 29-30 in the 1861 edition of Johnson's New Illustrated Family Atlas. This is the last edition of the Johnson Atlas to bear the 'Johnson and Browning' imprint. Subsequent editions reflect Ward's 1862 acquisition Ross C. Browning's shares in the firm. Very Good. Wear and verso reinforcement along original centerfold. Blank on verso. Some foxing and overall toning.